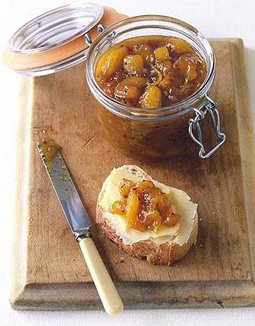 Apple Chutney - A recipe from Savor California, the online showcase for extraordinary gourmet foods and beverages from California. Combine the apples, onion, ginger, orange juice, Kokomo Verjus, brown sugar, mustard seed, pepper flakes and salt in a large saucepan. Bring the mixture to a boil over medium-high heat. Reduce the heat to simmer and continue cooking, stirring occasionally, for 1 hour, until most of the liquid has evaporated. Delicious with cheese, on top of pork chops, or to spice up a chicken salad.